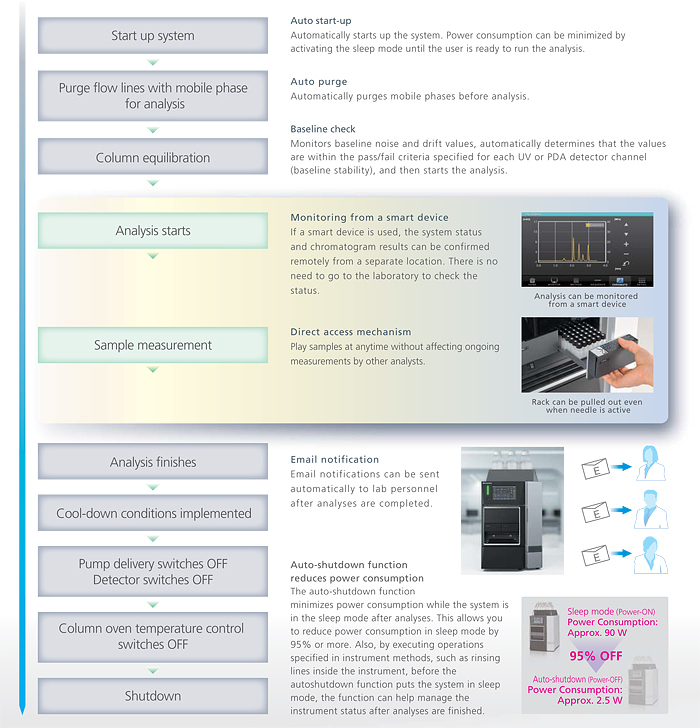 With the i-Series auto-validation function, anyone can follow a set procedure to examine solvent delivery stability, wavelength accuracy, absorbance accuracy, gradient accuracy, the presence of any drift/noise, and other parameters. In addition, a system check function automatically performs the routine inspections performed before using the instrument, and creates a report indicating system self-diagnostic results and a record of consumables used, such as the total solvent volume delivered by the delivery pump, the number of autosampler injections, and the number of hours the lamp has been illuminated. This makes it easy to accurately determine the instrument operating status. The entire series of operations involved in analysis can be automated, from system startup, mobile phase purging, column equilibration in preparation for starting measurements, and starting the analysis to shutting down the system after analysis. In combination with the automatic pass/fail judgment function for system conformity testing, operations for routine analysis, such as injecting samples based on test results and stopping the analysis, can also be automated.